As the Founder of Technousa, Sunny started the company in 2007 with about $100 in his bank account & his living room and from there on he has built it from just a name to a very futuristic company with 3 development centers in New Delhi, India. His unmatched entrepreneurship has shaped up the ground breaking services provided by Technousa in the field of software and business consulting. He has helped the company to evolve over the years and has played the major role in innovation and chalking out the roadmap for future growth opportunities. He has been involved in various facets of the companies and laid the foundation stone for all company processes around HR & Recruitments, Marketing & Sales, Software Development, Project Management & Delivery, Operations , Admin, Infrastructure and much more. His passion for everything he does, just manifests around him and motivates his team to perform beyond their caliber. He has been successful is building an open culture in the company where he or any other management person is easily approachable by the team. He holds a bachelor in engineering in Computer Science from ITM, Gurgaon. 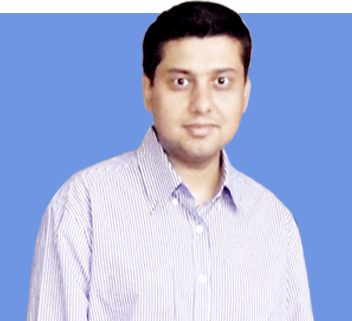 He has 10+ years of experience in the software industry where in his early professional life he has also worked as an Oracle Applications Techno Functional Consultant in one of the IT giants. It would not be fair to match his experience in years as he lives and breathes Technousa. Apart from managing the company as a whole, he is a very technical person and his team often consults him on the crucial solutions. It gives him immense joy to design the technical strategy of the company and makes sure that the resourcing teams are dedicatedly working towards building the best team of engineers and technical resources. He likes his "mission impossible" team to foray into technologies to make anything possible. His vision is crystal clear and drives all the departments of the company to work coherently towards the final goal of expanding the company to new horizons with each passing day, month and year. He wants Technousa to be on the forefront when it comes to technical and business solutions. He believes that the support functions/processes of his company are very crucial in crafting the success of a company hence is high Process Oriented and makes sure that his teams have all the possible resources at their disposal. His HR and recruitment team is able to function smoothly because of the foundation process laid by Sunny himself from sourcing to getting the candidate on board. He wants his marketing and sales team to be always aggressive while being clear on the end process so that Technousa is always doing quality work. It is because of the nature of work done by Technousa, that it has earned a status of being a sought after technology partner by many companies worldwide. Not only clients, investors also take keen interest in Technousa and Sunny makes sure that they get a clear idea about the current and future growth prospects and action plan of the company. He often oversees operations, admin and infrastructure so that the development and other teams are never caught in a hurdle and continue to be productive. The clients of Technousa often like to speak with Sunny on major business decisions related to their software systems and are always thankful that they consulted him before finalizing on things. Sunny is a first generation entrepreneur with vast knowledge and the ability to apply this knowledge in his everyday work and also sharing it with his team. Apart from work he is a fun loving person and enjoys dancing, listening to music, trying his hands on guitar, exploring new places, spending time with his Rockstar 5 year old boy and reading motivational content. He also encourages his team to have fun along with work and have a work life balance, so that they do not lose out on their zeal to perform.